Absolutely delicious, easy and super nutritious! This is one of my all-time go-to recipes. It is something I used to eat gladly in Romania ever since I was a child, as my mom used to make it a lot. Believe me, this is not me being all sentimental about my childhood. Nope, it tastes great and things pass the test of time because of their qualities. This is one of those things. I am all for easy and fast recipes, but I also want to make sure that I add a healthy amount of protein and nutrients in my family’s diet. This recipe is perfect. The smoked bacon and the Cabanossi sausages give it a unique flavor that you will absolutely love. 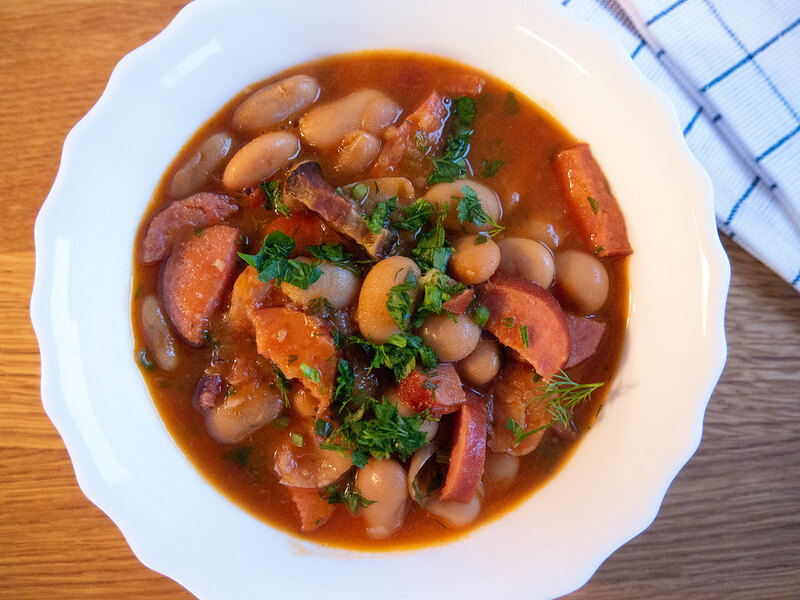 I go for big white canned beans because it is so much faster, but you can definitely use dried beans as well. They are not hard to make, you just need to soak them in water for 8 hours and then cook them according to which type of beans they are. I chose to cook this whole dish in my German pressure cooker, but you can easily cook this an Instant Pot as well. I rarely like reading a 2 page long introductions to a recipe when I want to cook it, so let´s just jump right into it. Chop onions, bacon, sausage and parsley into small pieces. Heat up the sunflower oil in the meantime in your pressure pot and add the bacon. Fry for 2 minutes on medium-high heat. Add the sausage for another 1 1/2 minutes and stir continuously to prevent it from sticking. Add the onions and continue cooking for 1 1/2 minutes. Add the 4 cans of washed beans, together with the 2 cups of water and bring to a boil. Once it is boiling, close the lid to the pressure cooker and place everything under pressure for about 15 minutes. Add fresh parsley or dill when serving. * This post may contain affiliate links. Please read my disclaimer for more info.